This new documentary is hard to watch. You should see it anyway. Georginia Sappier-Richardson sharing her story at a TRC community visit. The documentary film “Dawnland,” which will screen this weekend at the Camden International Film Festival, is not an easy film to watch. But the story it tells about the groundbreaking Maine-Wabanaki Truth & Reconciliation Commission is one that’s important for anyone to hear — Native and non-Native alike. The TRC began in 2013, bringing together members of the Penobscot, Passamaquoddy, Maliseet and Mi’kmaq tribes along with representatives from the Maine state government. The goal was to document the traumatic experiences of Wabanaki people, a number of whom throughout the 20th century were forcibly taken from their Native homes and placed with white foster families. The policy of forced removal of children from Native homes did not officially stop until the passage of the Indian Child Welfare Act in 1978, though full compliance in Maine was not achieved until 1999. The seeds for “Dawnland” were planted about five years ago, when Boston-based directors Adam Mazo and Ben Pender-Cudlip heard a radio spot about the Maine-Wabanaki TRC. The fact that a TRC was being convened in Maine was remarkable to them, considering Mazo’s previous feature, “Coexist,” was about TRCs held after the Rwandan genocide. Over the course of the commission’s three-year process, Mazo, Pender-Cudlip and crew filmed hours of often-harrowing testimony from Wabanaki people, training an unflinching eye on individuals telling their deeply painful stories — stories of forced assimilation, abuse and outright, often codified, racism against Native people. Dawn Neptune Adams was one of those Wabanaki people who testified for the commission and whose story is featured in “Dawnland.” She was born into the Penobscot Nation, but at the age of 4 was removed from her home and placed in a non-Native foster home in Brewer. 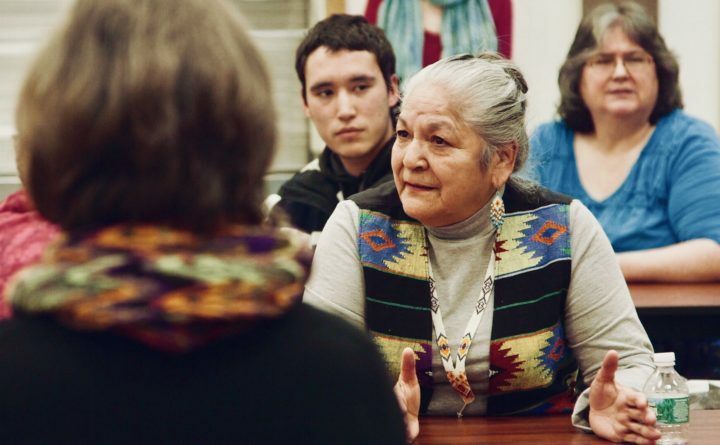 In April, the film was shown at community centers for all four tribes, resulting in even more dialogue after each screening — for a number of audience members, seeing the film was the first time they’d heard their stories after telling them to the commission, a process that was at the time a totally private, intimate thing. The development of “Dawnland” was helped, in part, by Pender-Cudlip and Mazo being named Points North fellows for the 2014 Camden International Film Festival, which provides funding and other assistance for feature-length documentary films. Four years later, “Dawnland” has its official Maine premiere at that same festival, though the film has played in a few other places across the country over the past few months. Adams, who has participated in “Dawnland” screening discussions in a number of locations, said the reactions among viewers elsewhere across the country has been overwhelmingly positive — as a chance to learn about the Wabanaki people, to witness the resilience of Native people in general, and to inspire future opportunities for healing and change. “What the ‘Dawnland’ team has done is amplify our voices, so more people across the world not only know about what has happened here, but can be inspired to start the process with their own tribes, in their own states,” she said. “Dawnland” will screen at 3 p.m. Sunday, Sept. 16, at the Camden Opera House, as part of the Camden International Film Festival. Other Maine screenings include 7 p.m. Thursday, Oct. 4, at the Stonington Opera House; 1 p.m. Oct. 7 at the Belfast Free Library; 7 p.m. Oct. 7 at the Criterion Theatre in Bar Harbor; and 7 p.m. Oct. 8 at the Bangor Opera House. It will have its television premiere on PBS’ “Independent Lens” at 10 p.m. Monday, Nov. 5.